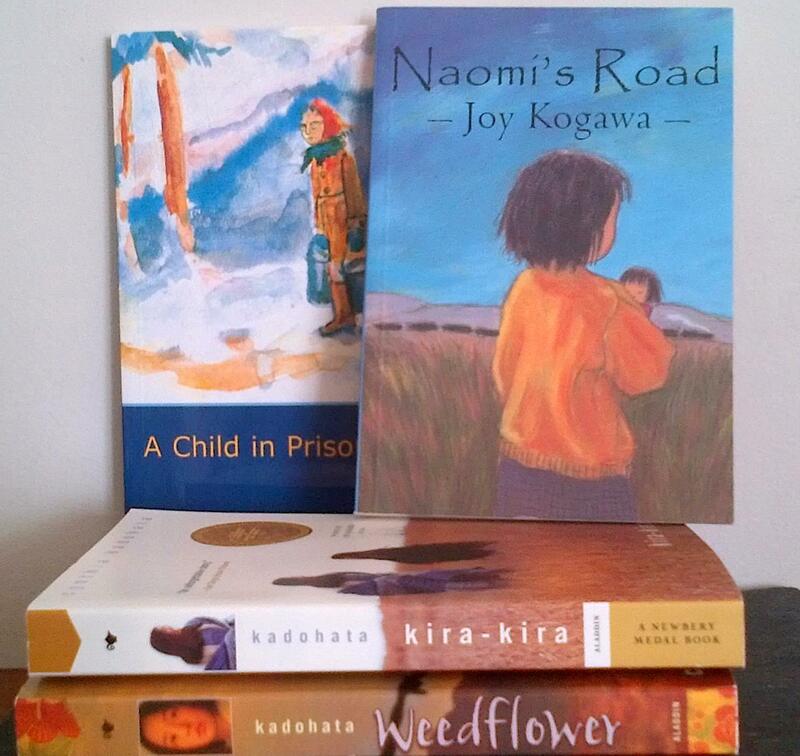 I was revising my Family Memoirs page last evening, and decided to recommend a few books today on the subject of the Japanese Canadian Internment that were written specifically for children and young adults. Of course one thing leads to another, and I pulled other titles from my bookshelf that you might be interested in borrowing from your local library. A Child in Prison Camp (Middle Grade) by Shizuye Takashima ; illustrated by the author (Tundra Books, 1992) Note: Includes four inserted pages of eight plates reproducing the author’s delicate, impressionistic watercolour paintings of her life in an internment camp. Naomi’s Tree (Picture Book) by Joy Kogawa ; illustrated by Ruth Ohi (Fitzhenry & Whiteside, c2011) Suggestion: Click on my Just One More Book link for a podcast interview with Joy Kogawa and Ruth Ohi. You can search the site by both author and illustrator. 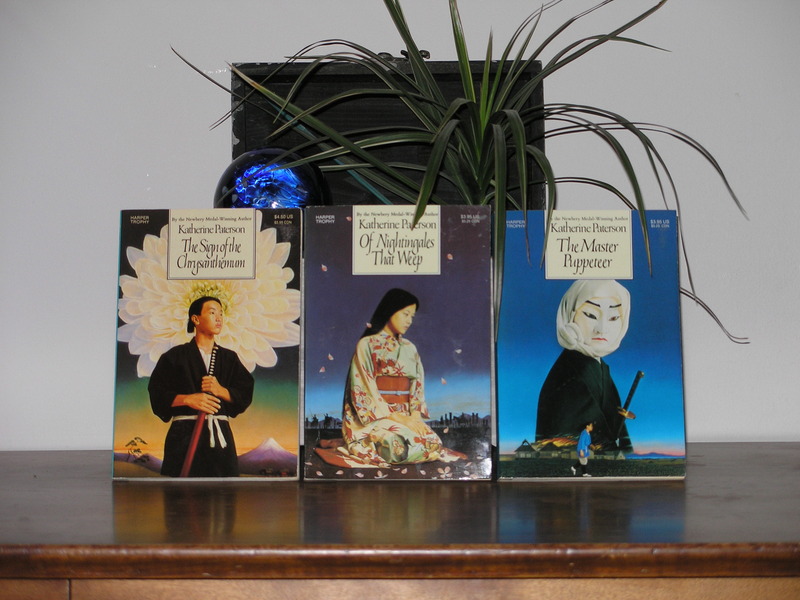 The Tale of the Mandarin Ducks by Katherine Paterson ; illustrated by Leo & Diane Dillon (Lodestar Books, c1990) Note: Illustrations were done in the style of eighteenth century Japanese woodcuts. 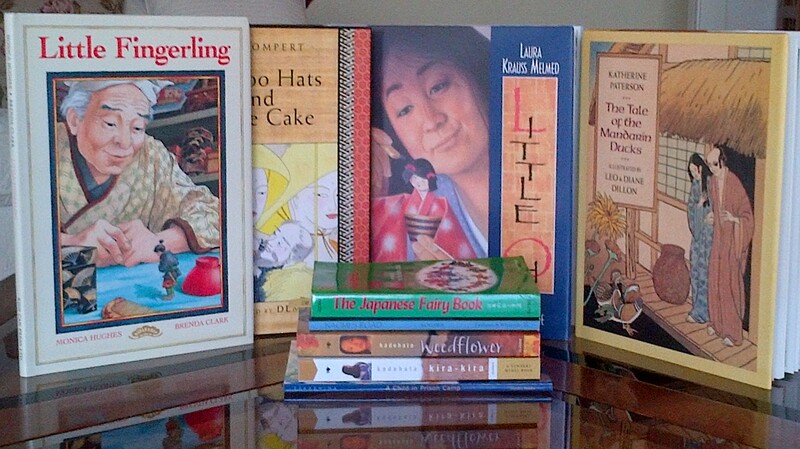 Bamboo Hats and a Rice Cake: a tale adapted from Japanese folklore by Ann Tompert ; illustrated by DEMI (Crown Publishers, c1993) Note: “For Bamboo Hats and a Rice Cake, she [the illustrator] combined pen-and-ink drawing, painting, and backgrounds of fine handmade paper.”–Inside flap of cover jacket. The English text is embedded with Japanese hiragana and kanji characters, which are also to be found with their English translations down one side of each page. It starts with one, then two (repeating for several pages), then three (repeating), four, five, etc. By the end of the book, you and the child you read it to may very well recognize what the symbols mean in English. Fun! Of course I have to put in a plug for used book stores, which may not exist for much longer if e-books start replacing every print edition ever published. There’s nothing more adventurous to do with one’s spare time than to browse through shelves that have been stuffed or stacked with books on every imaginable topic. 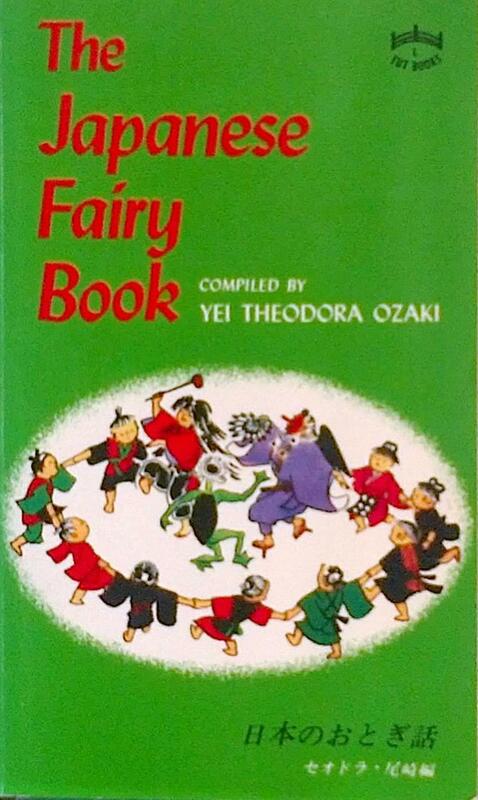 I found The Japanese Fairy Book compiled by Yei Theodora Ozaki in the Attic Owl Bookstore around the corner from me some time ago, so I was disappointed when the shop closed a few years later. The book was published by Charles E. Tuttle Company (Rutland, Vermont & Tokyo, Japan ; c1970) and was into its twenty-third printing by 1989. “Beautiful legends and tales of old Japan…quaint but evocative and humanly stirring illustrations by Kakuzo Fujiyama, an artist who lives in Tokyo.” Even though a few of the books I mention above have older publication dates, they would likely be available for purchase online. Although I will not write a Book Review unless invited to do so, I hope anyone who comes across one of these entries will follow up on a recommendation I make by visiting their local bookstore or library. This is an engaging story of a ten year-old orphan—Arty Brown—whose dream of going to sea on the Bluenose in 1921 becomes a reality after he’s hired to be the “flunkey” on board the schooner during its maiden voyage. Details of the day-to-day hard work demanded of him and of two older boys—Sam, a “throater” and Tobin, a “header”—are told with historical authenticity and are seamlessly woven into the plot. Although Arty is forced to endure incidents of bullying at the hands of Tobin, he responds to him with unexpected maturity and compassion following an averted disaster, the climax of the book. While describing Arty’s adventures, the author deftly touches on the subject of literacy as it relates to children who had no choice but to work for wages at the expense of their education. In addition, by creating the character of Big Sal who is always there for Arty when he needs her, Jacqueline Halsey demonstrates the importance of community as it was back then, and as it should be now. Did I mention humour? There’s a dash of that, too! A one-stop glossary of fishery-related words would have been a useful addition to the book, though not entirely necessary; terms such as “flunkey”, “throat-kid box” and “header” are all clearly explained within the context of the story as it unfolds. Perhaps the illustrator deliberately chose to use a subdued palette in order to evoke the mood of a working fishing schooner at sea, however, sometimes the colours seemed unnecessarily drab, especially in the shore scenes. I highly recommend this tale for readers of all ages.